One of our clients is Dreamworks illustrator Matt Doering. We recently got to talk to him about his journey as an artist – In part 1, he shared his origin story (if you haven’t read that yet, check it out). This is part 2, where he shares how he became an entrepreneur. As he was growing up, Matt knew he wanted to be an animator. Thanks to his grandfather’s early influence, Matt knew his “what” and his “why” long before he knew the “how”. As in, how was he going to break into the tight animation community? Matt knew he needed exposure to the people he wanted to meet. 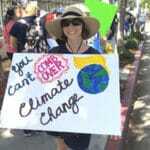 The answer seemed clear: getting into the convention circuit. By getting a table at animation conventions Matt knew he’d have an opportunity to be around the people he needed to meet. And it worked. Matt’s first con was in 2012 at the Disney Animation Expo. He got a cheap exhibitors table and offered prints for sale. Though he did sell some prints, the real value came from having an exhibitors badge. That badge gave him credibility he might not have had otherwise, leveling the playing field between him and important figures in the animation world. For a couple of years Matt’s goal was to gain as much exposure as he could, meet the right people, and try to advance his career. By 2015 his plan had worked and he had broken into the animation industry. From that point his focus switched from exposure to entrepreneurship. He wanted to start making a return on his table investments. So he started to strategize and come up with unique product ideas to bring attention to himself and his art. He wanted to focus on creating products to sell and building his own personal brand. One of his first products was log art. Using slices of wood, Matt transferred his art onto the rustic surface, trying to match the drawing to the wood grain and rural aesthetic. His log art became pretty well-known, and he moved on to another unusual art form. Cardboard. Matt’s 3D cardboard art, though interesting, was slightly less popular. 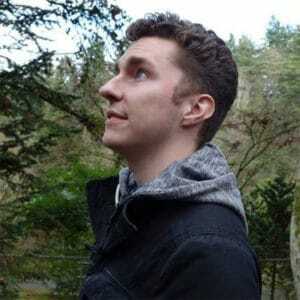 With each iteration of his products, Matt learned a bit more about what people wanted and how he could provide that. Then he discovered enamel pins. 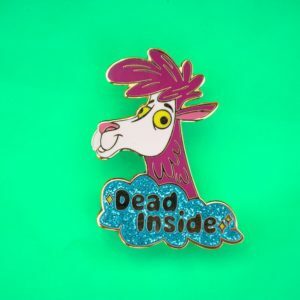 Emotional Crisis Llama enamel pin by Matt Doering. Matt’s first pins, his Sassy Llama pins, were created in 2016. He found that people loved collecting his pins and it was fun to create around the llama theme. His hipster llama, party llama, and emotional crisis llama have all been big sellers at cons – and in his Etsy store. While Matt has had success with his enamel pin designs, he’s also got his eye on the future. He wants his side business to grow, but not at the expense of his main career in animation. Right now he exhibits at about four cons a year. Over the next couple of years he has plans to step back from the shows and scale up his pin collections and Etsy store. He’s toying with different pin ideas, including turning a set of Game of Thrones postcards he created into a pin series. 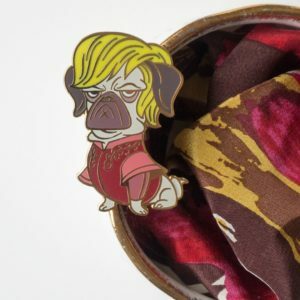 Tyrion Lannister pug, from the Game of Bones collection by Matt Doering. not all just fun and creation. It’s about having a hook, having what you think your audience might want, and figuring out the best way to deliver it” Matt shared. Matt’s perspective on his career path wasn’t born overnight. It came from thinking about multiple points of view and having conversations with lots of different people. “All throughout my career, from when I was just starting out to today, I’ve talked everything over with people I trust. We’ve had debates and I’ve taken it all in. At difficult points I got really good advice, and I tried my best to listen to it all, then trust my instinct,” Matt said. The best advice Matt has for aspiring artists, is to trust that it will eventually happen. You have to take risks and chances to keep moving forward, but at the same time, you have to make sure you can survive along the way. Matt’s journey is far from over, and though he’s achieved a lot in the years since he left his small town in West Virginia, he knows he still has a long way to go. “I’m excited to see where things go with my business. Pretty soon I’m going to have some time to take a step back to do some reflection and figure out my next course of action. Think about where I want to go, what I want to pursue. There are lots of new phases coming up!” Matt said. No matter where his path takes him next, we feel sure that Matt will come out on top.